The sportswear empire of Newcastle United owner Mike Ashley has snapped up almost 5% of shares in department store Debenhams, it emerged today. Sports Direct International said the stock market purchase, worth around £46million, would allow the companies to consider ways to work together. 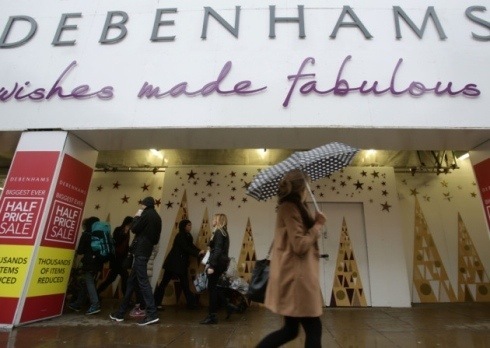 Debenhams, which issued a profits warning on New Year’s Eve after poor Christmas trading, said it was open-minded about the offer of exploring operational opportunities in order to improve its performance. As well as 409 stores in the UK, Sports Direct has a portfolio of 28 internationally recognised sports, fashion and lifestyle brands including Dunlop, Slazenger, Everlast, Lonsdale and Karrimor. Mr Ashley set up the business on leaving school in 1982 and was the sole owner until a stock market listing in March 2007 which netted him £929 million. He is executive deputy chairman but receives no payment. The company, which has purchased 56.8 million shares in Debenhams, has a history of buying strategic stakes in other retailers, most recently JJB Sports. It is the current owner of a near 12% holding in rival JD Sports Fashion. It said today: “Sports Direct wishes to explore options at an operational level to work together with Debenhams to create value in the interests of both Sports Direct’s and Debenhams’ shareholders. Debenhams which has 240 stores in 29 countries. In the UK, where it has more than 150 stores, the chain has a top five market share in womenswear and menswear and a top 10 share in the market for childrenswear. The company said: “Debenhams notes that Sports Direct intends to be a supportive shareholder and that it wishes to explore options at an operational level to work together. Debenhams’ shares rose 5% today, although Cantor Fitzgerald retail analyst Freddie George said today’s developments did not mean the company was “in play” from a takeover perspective. Mr Ashley’s Sports Direct business is believed to have looked closely at acquiring House of Fraser in the last year. Posted on January 13, 2014, in Other. Bookmark the permalink. Leave a comment.